When I saw this challenge prompt over at Fun With ATC's, I immediately thought I wanted to do something with it, because I love old movies. After which it totally escaped my attention and I forgot completely about it. Untill this weekend, when I found myself in need of an ATC to send out with my little package to my one hundredth follower (Jan). So I made a few inspired by the prompt from Fun with ATC's and some old movie stars I loved watching when I was a child. Here are some close-up shots and a sneek peek at the package for Jan. I covered some ATC sized cardboard pieces with gesso and glued an old map to them. I tore away pieces of the old map. And distressed the ATC's with gathered twigs distress ink. After sanding down the edges. I fussy cut the images from Laurel and Hardy. Glued them down and edged them with a white paint pen. Did a little stamping and added my info to the back. And then they were ready for shipping =). Thank you all for watching and I wish you a wonderful week. Love L & H! Great ATCs! Thanks for the blog visit and comment! I also agree with Julie-- Buster is one of my favorites. Fun idea & very nicely done! I particularly love your And stamp, it has a really vintage look! These are fantastic ATCs. Indeed fabulous old movie stars. They are wonderful, Monique... just the images made me smile, and your beautiful backgrounds and stamping give them the perfect setting. Thanks so much for playing along with us at Fun With ATCs. I love these--love Laurel and Hardy and what a fun set of cards!! They're really great! I love your ATCs so much!!! How great and fun they are! wonderful ATCS Monique.. I also was a big fan and every wednesday I watched Stan and Ollie as I was 9 years old on the Aurtian television ..and I can tell you that I will love this famous wonderful couple forever! They are unique! No better couple ever since ! Gosh! 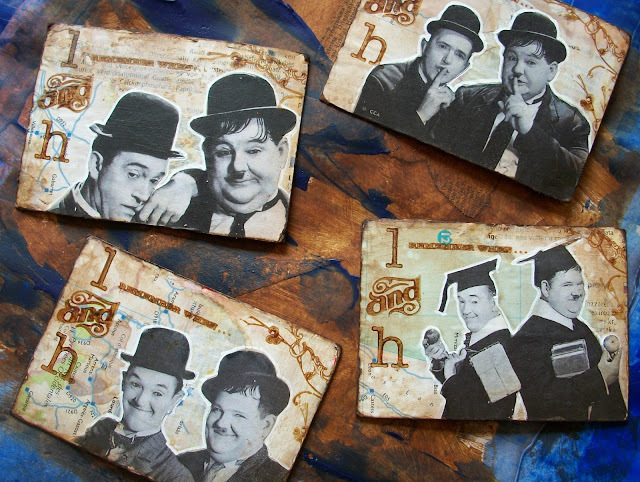 I am a huge Laurel&Hardy fan and your ATCs are just perfect! Thank you for playing along with us at FunwithATCs! Hello, Monique! Your ATCs are so lovely and funny!